You don’t need a Kitchenaid to make these sticky, pull apart cinnamon rolls! 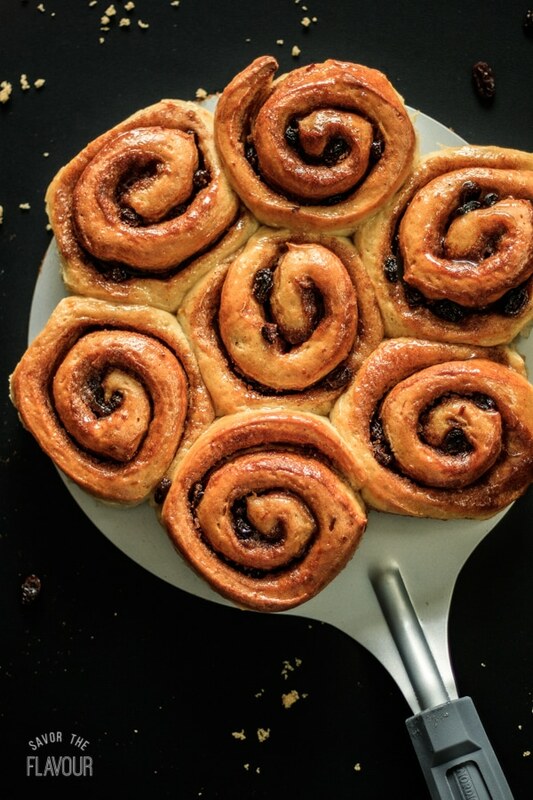 You can learn how to make these fragrant homemade cinnamon rolls in just a few simple steps. Imagine eating these sweet treats on Christmas morning! 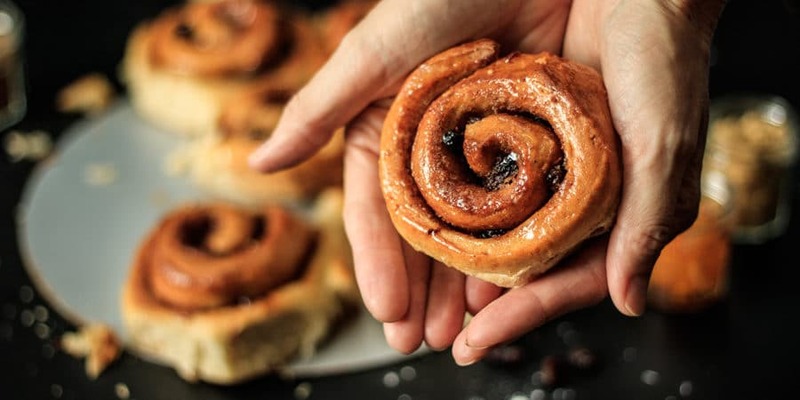 Often times, when I visit the food court at a shopping mall, they will have a little shop selling wonderful cinnamon buns, chock full of cinnamon and sugar, drizzled with icing… and loaded with several hundred delicious calories! 😉 It’s hard to walk past it without wanting one. Even if you can’t justify buying one at the mall, you don’t have to go without a dose of soft, sticky deliciousness! 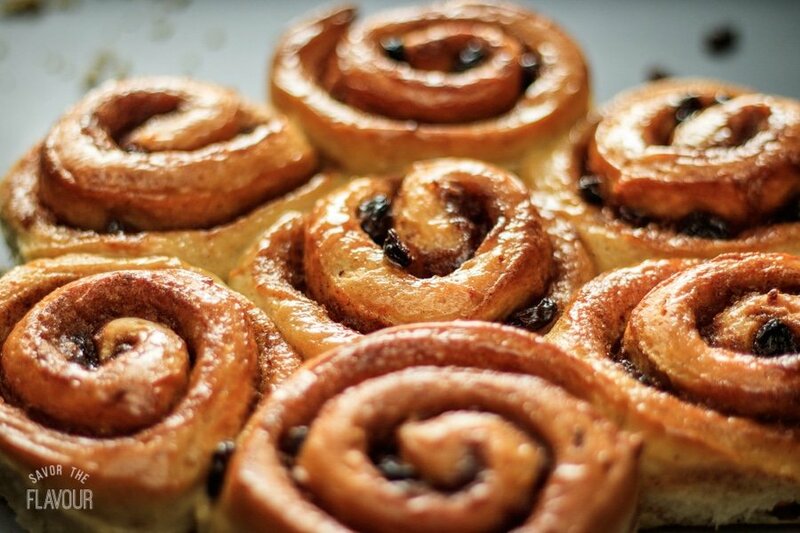 Here’s an easy recipe to make your own cinnamon buns with raisins, from scratch. Your house will be guaranteed to smell amazing! Besides, they won’t have preservatives in them like store-bought buns, and you’ll have the satisfaction of making your own. The bread dough for this recipe is an enriched dough, which means it contains ingredients like butter, sugar, eggs, and milk. These extra ingredients make your bread sweeter, softer, and more richly flavored. However, adding any of these will slow down the bread’s rise, or prove. Don’t be discouraged, though–the extra wait will be worth it! If you are pressed for time, make your dough the day before and prove it overnight in the fridge. The cold temperature in the fridge will further slow down the prove, which will actually result in a better flavored dough. It might seem a little different to glaze the buns with apricot jam after they’re baked, but don’t be tempted to skip this step. It results in an even lovelier golden brown finish to your buns, and gives them that wonderful sticky coating. Another word of wisdom–this recipe makes about 16 large buns. If you can’t eat them all up the same day or the next, just freeze them. Then you can pull out a bun any time you like! Put the flour into a large bowl. Add the salt and yeast on opposite sides of the bowl, and stir each one in with your finger. Dump in the spices, sugar, and orange zest, and mix everything together with your whole hand. Using a saucepan or the microwave, heat the milk to 100-110 F, and melt the unsalted butter. Make sure both the milk and butter are no hotter than 110 F so they do not kill the yeast. Pour in the milk, butter, and beaten egg and mix by hand until everything is fully incorporated. Knead on a lightly floured countertop for 5 to 10 minutes until the dough is stretchy, smooth, and no longer extremely sticky. Be careful not to add too much flour at this stage, or the dough will be tough and dry. Form the dough into a ball, then prove in a lightly oiled bowl covered tightly with cling wrap for about 1 1/2 to 2 hours, or until at least doubled in size. Turn the dough out onto a lightly floured cutting board, and punch it down all over to knock out the air. Roll the dough out to an approximately 13″ by 17″ rectangle with a long edge facing you. Stick down the long side of the dough opposite you by pushing the edge of the dough down at an angle. This will help you get a tight roll later. Spread the softened butter all over the dough, making sure to get right to the edge. Then, sprinkle the brown sugar, raisins, and cinnamon evenly across the dough. Roll up the dough, starting with the long side closest to you. Be sure to roll tightly to get a good shape. Press down gently on the roll with the flat of your hands and roll it back and forth a couple times to lengthen it some. Using a large stainless steel scraper or sharp knife, divide the dough into 16 equal pieces, including the ends. Place the buns in a circular pattern on a circular baking stone. Make sure to place the buns about 1/2 inch apart so their sides can join together as they prove and bake. Cover the buns with cling wrap and leave to prove for 30-45 minutes, depending upon the temperature in your room. The buns’ sides should be touching once they are proved. About 10 minutes before the buns are done proving, preheat the oven to 375 F.
Bake the buns in the center of the oven for 20-25 minutes. If the filling starts to burn, cover the buns with aluminum foil. The buns should be a rich golden brown, but not too dark. Let the buns cool on the baking stone for 10 minutes, then move them to two cooling racks placed side by side. You may need multiple spatulas and hands to help, as the buns are very soft. While the buns are cooling, prepare the decoration. Heat the apricot jam in a small pot until warm, stirring frequently, then push through a sieve to remove the lumps of fruit. Then, brush the sieved jam all over the buns while they are still warm. Let the buns cool some before tearing them. Eat them warm with soft butter. Cinnamon buns are very delicious. The apricot jam makes it shiny and tasty. Very good! 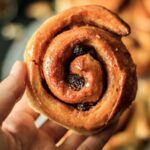 I agree–cinnamon buns are one of my favorite sweet breads! Grandpa can make some good cinnamon buns, too!